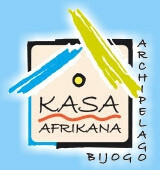 KASA AFRIKANA is a charming and homey hotel sufficiently equipped to meet your most fastidious demands in a fine tropical garden on Bubaque island. It is above all a fishing club, we have seven boats that are skippered by seasoned sailors who are keen on sport fishing; they will guide you towards unique places for sport fishing in the Bijagos islands. You plan a stay relaxing with your family in the Bijagos archipelago ? In a quiet and pleasant hotel on Bubaque island with pool, quad, atvs and all equipment necessary to the comfort of the most demanding of you is the ideal place for successful holidays in Guinea Bissau.